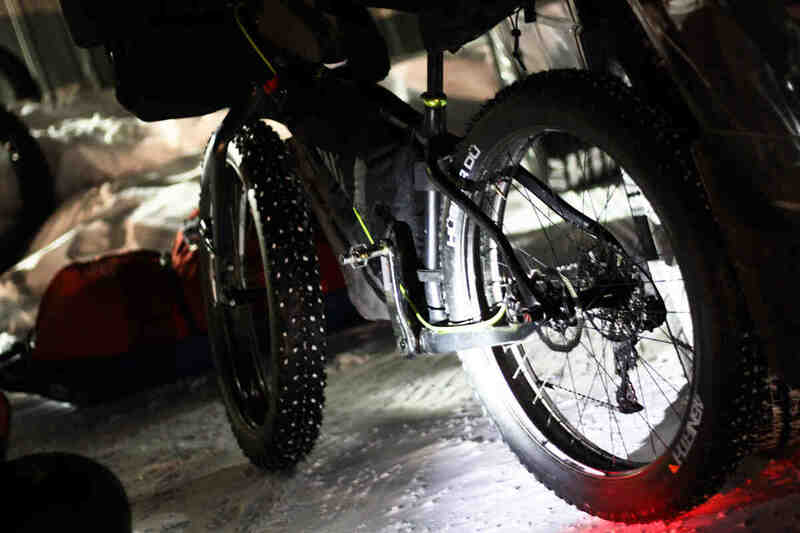 45North sponsored rider and Alaska Iditasport 350 record-holder, Jay Petervary, won his first Arrowhead 135 in some of the most extreme conditions the event has seen. We were there to follow Jay along the entire course and create a photo documentary of the experience. You will want to start at the beginning and read the captions all the way to the end. Thanks to Mike “Kid” Riemer from Salsa Cycles for guiding us around the best spots of the course. Enjoy! Racers arrive at the mandatory check-in just moments before the 7:00am start. Jay chose to run a Dillinger studless tire in the front for optimal cornering and braking traction, and Hüsker Dü in the rear for the lowest possible rolling resistance. Cobrafist pogies protected his hands from the -50°F windchills. Less than one minute from the start and Jay is still warming up and not on the line. The snow is squeaky like styrofoam in the -23°F air temperature. 30 minutes into the race and he's charging out of the saddle opening a several minute gap on the nearest competitor. Todd McFadden rides past and informs us that he was late to the start because of a malfunctioning battery light. Steve Yore riding a few places behind the leaders early in the race, looking quite strong. Snow drifts covered some parts of the trail from the strong winds. 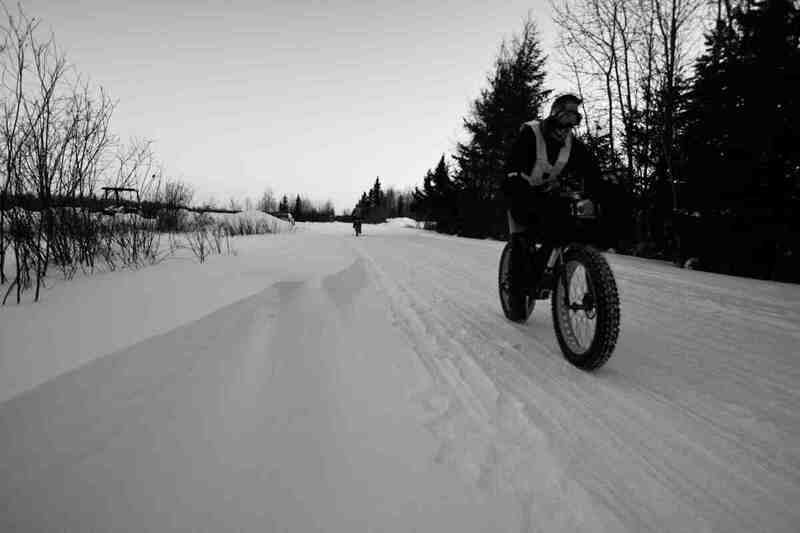 Riders were strung out across several miles along the trail. Approximately 90 minutes into the race Jay was approaching the first crossing of highway 53 moving at a very fast pace on the solid trail. Steve Yore approached the first crossing of Highway 53 in second place, 22 minutes behind Petervary. It was a beautiful morning to be out on the Arrowhead Trail as the sun peeked above the trees. Jay was still looking very strong and building his lead as he approached the Gateway Store, approximately 4 hours into the race. Steve Yore approached the Gateway Store still trailing Jay and looking fit for the competition. Jay came through Sheep Ranch Road around 1pm looking like he was enjoying the abundant sunshine in the arctic temperatures that were freezing the condensation on his Greazy merino wool hat. The conditions on Elephant Lake at the MelGeorge's check point were brutal. Gusty winds were blowing snow across the lake, bringing wind chill values to -50°F. After nearly an hour of waiting on the wind-swept lake, a figure appeared in the distance. He now had a hood on and his face was fully covered. 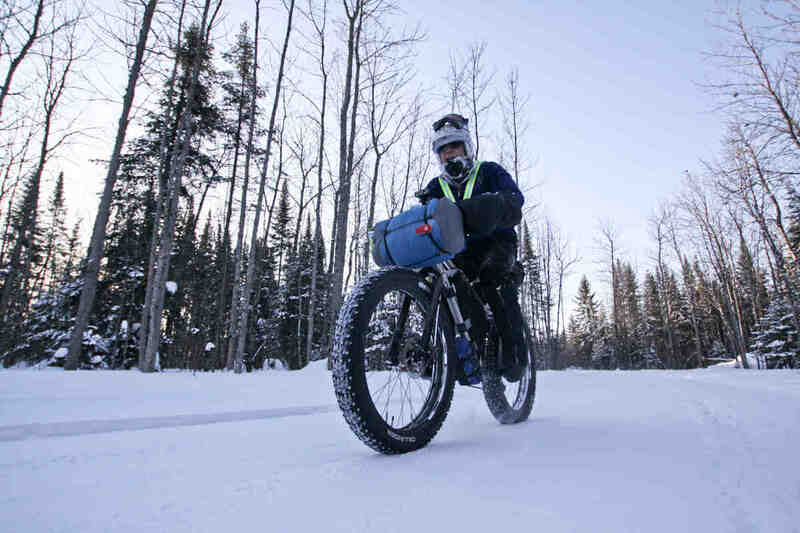 The experience racing across Alaska and training in his native Idaho has trained him to adjust to the conditions or suffer the consequences of frostbite, hypothermia and dehydration. The relentless headwind could either be demoralizing or motivating. 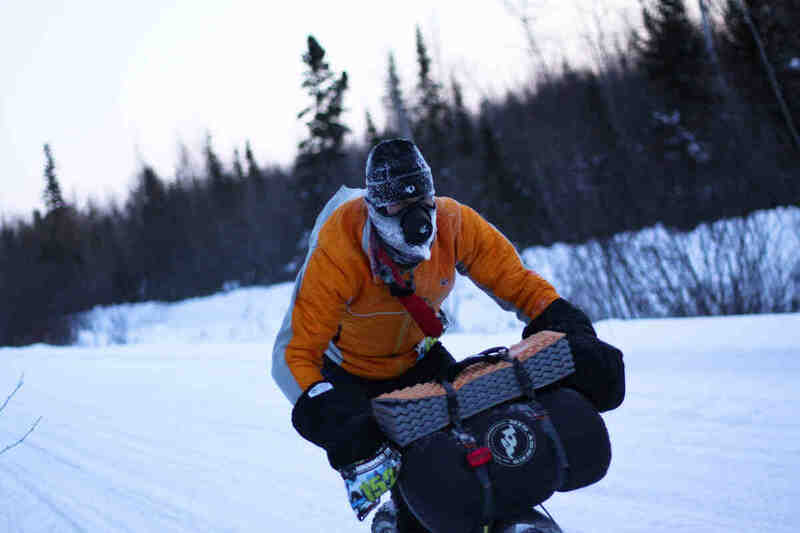 It seemed to motivate Jay as he dug deep into his pedals towards the official checkpoint. Jay's rig parked outside the MelGeorge's checkpoint when he arrived at 3:26pm. All damp clothing was removed and placed near the stove to dry. It was not long before the clothes and boots came back on in preparation for a long second half of the race in the cold, dark night. Leaving MelGeorge's after freshening up the damp gear. Minutes after Jay left MelGeorges checkpoint Steve Yore rolled in, ready for some respite before nightfall. 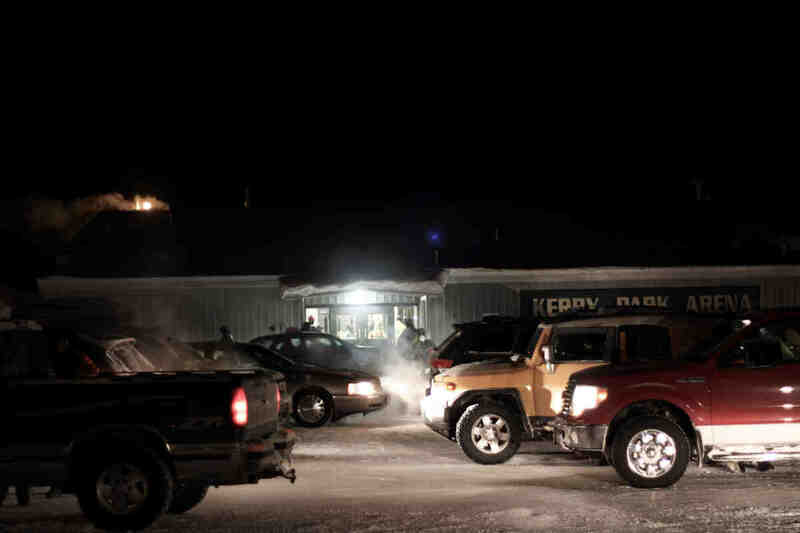 After some misfortunes with frostbite Todd McFadden and Casey Krueger packed up and settled into the comfort of MelGeorges resort and restaurant. 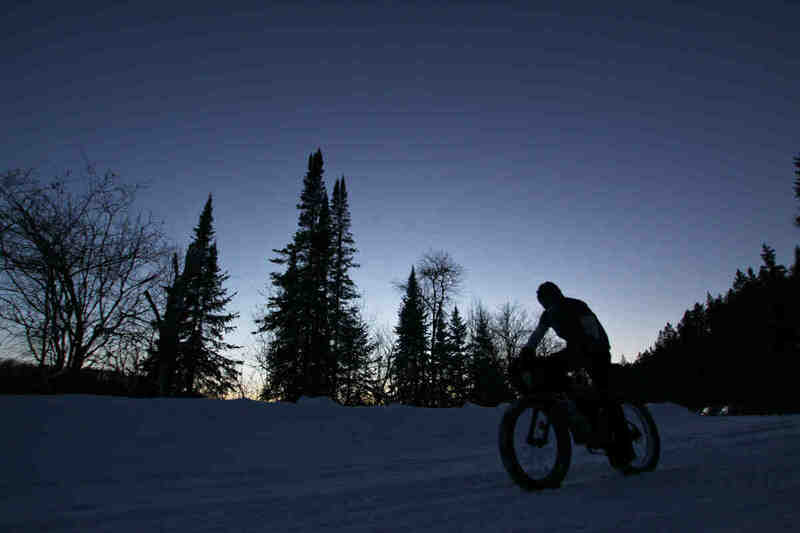 Out of the saddle again, Jay powered his way into the night as temperatures dropped towards -30°F. This is the last we would see of him in daylight. Later in the evening, as temperatures dipped past -30°F in the low-lying swamps along the trail, we heard that Steve Yore had called it quits. In that same report we learned that Tom Puzak had left the Ski Pulk checkpoint only minutes after Jay and was now trailing closely behind him in second place. Would Jay be able to keep up his pace? 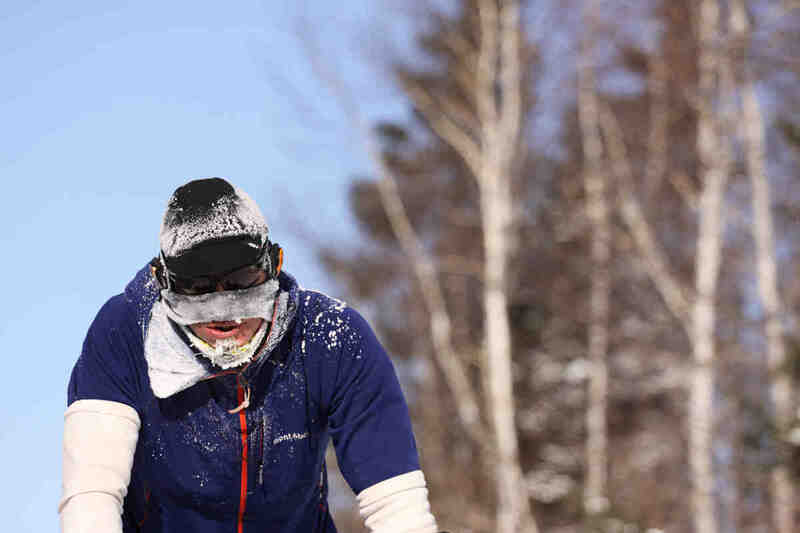 Would Puzak succumb to exhaustion by rushing his way out of Ski Pulk checkpoint? The answer to that would not be known until the finish line at Fortune Bay. After 7 hours of waiting at the finish line a light appeared out of the woods heading towards the finish line at 3:11am. As it moved ever so slowly towards us the anxiety rose higher and higher. Was it Jay or Tom heading towards victory? Jay emerged from the night with a face covered in frost to claim his first Arrowhead 135 victory! 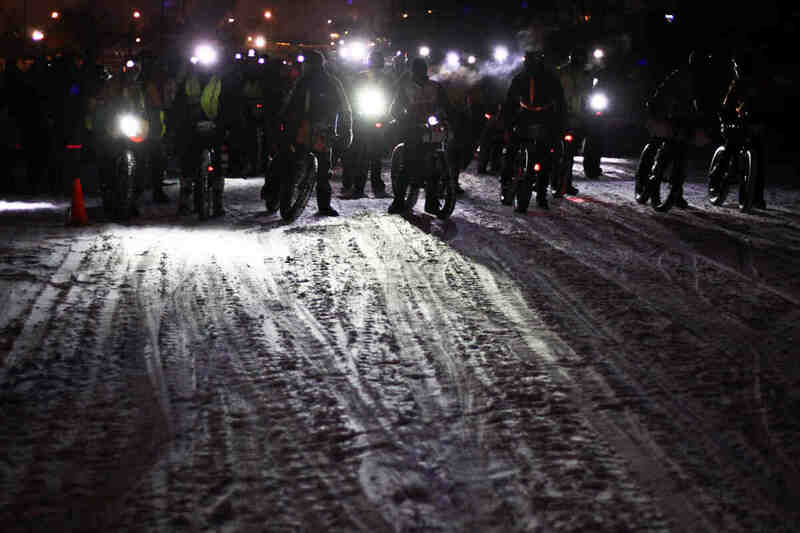 It was an absolutely incredible performance in the most adverse of cycling conditions. Once inside the warm building at Fortune Bay we began the task of removing everything from his head. 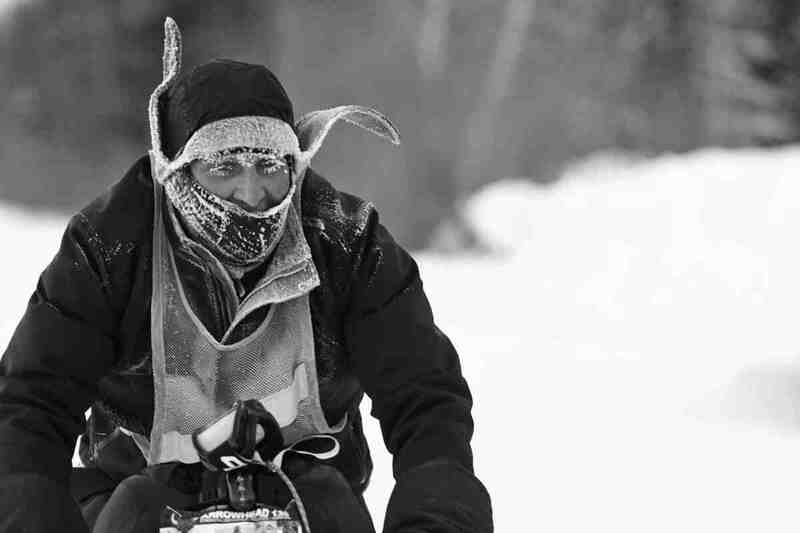 He had ridden for more than 20 hours in -20°F temperatures, accumulating condensation on anything that wicked moisture or absorbed his breath. A well-deserved foot massage and bowl of soup after a long battle. 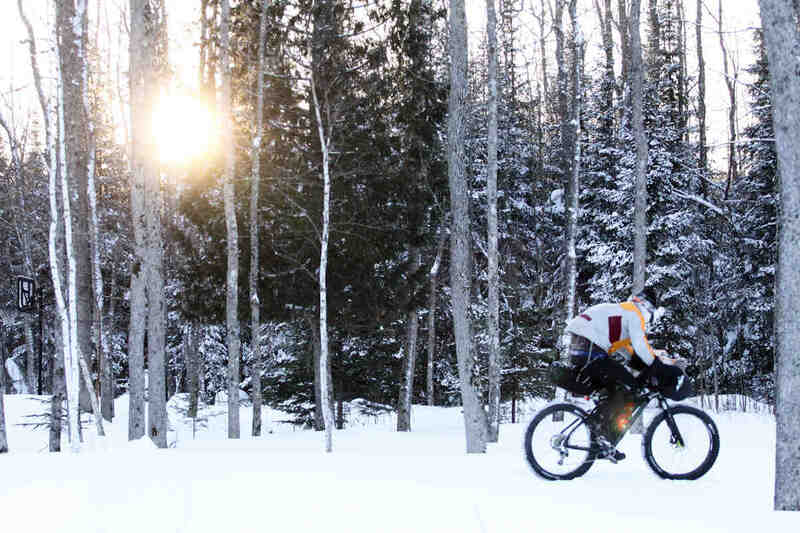 It takes experience, tenacity and courage to ride a bicycle 135 miles for more than 20 hours at -20°F temperatures. Congratulations to Jay and everyone who had the courage start the race and take chances that most ordinary people are unwilling to take. May you only experience more comfort, more control, and more confidence as you carry forward with your extreme winter cycling pursuits. 45North gear used: Wölvhammer boots, Bergraven gaiters, Cobrafist pogies, Dillinger studless tire (front), Hüsker Dü tire (rear), Greazy hat, Wool socks.